Also available as: PDF, LaTeX. The literature related to virtual R&D teams reveals a lack of depth in the definitions (Ale Ebrahim et al., 2010). Although virtual teamwork is a current topic in the literature concerning global organizations, it is problematic to define the meaning of 'virtual teams' across multiple institutional contexts (Chudoba et al., 2005). The concept of a "team" is described as a small number of people with complementary skills who are equally committed to a common purpose, goal, and working approach for which they hold themselves mutually accountable (Zenun et al., 2007). It is worth mentioning that virtual teams (VTs) are often formed to overcome geographical or temporal separations (Cascio and Shurygailo, 2003). VTs work across boundaries of time and space using modern computer-driven technologies (Ebrahim et al., 2010). The term "VTs" is used to cover a wide range of activities and forms of technology-supported working (Anderson et al., 2007). Gassmann and Von Zedtwitz (2003) defined "virtual team as a group of people and sub-teams who interact through interdependent tasks guided by common purpose and work across links strengthened by information, communication, and transport technologies". Another definition suggests that virtual teams, are distributed work teams whose members are geographically dispersed and coordinate their work, predominantly with electronic information and communication technologies (e-mail, video conferencing, telephone, etc.) (Hertel et al., 2005). From the perspective of Leenders et al. (2003), VTs are groups of individuals collaborating in the execution of a specific project while geographically and often temporally distributed, possibly anywhere within (and beyond) their parent organization. Among the different definitions for virtual teams the following form is one of the most widely accepted definition: ''VTs as groups of geographically, organizationally and/or time dispersed workers brought together by information technologies to accomplish one or more organization tasks''(Powell et al., 2004). Therefore, a comprehensive definition of virtual teams may be taken as: small temporary groups of geographically, organizationally and/or time dispersed knowledge workers who coordinate their work, predominantly with electronic information and communication technologies in order to accomplish one or more organization tasks (Ale Ebrahim et al., 2009). Nowadays, this definition have gained popularity as found in Wikipedia (wikipedia, 2011). Virtual R&D team is a kind of virtual team that concentrate on the R&D tasks and projects (Ale Ebrahim et al., 2011). ALE EBRAHIM, N., ABDUL RASHID, S. H., AHMED, S. & TAHA, Z. 2011. The Effectiveness of Virtual R&D Teams in SMEs: Experiences of Malaysian SMEs. Industrial Engineering and Management Systems, 10, 109-114. ALE EBRAHIM, N., AHMED, S. & TAHA, Z. 2009. Virtual R & D teams in small and medium enterprises: A literature review. Scientific Research and Essay, 4, 1575-1590. ALE EBRAHIM, N., AHMED, S. & TAHA, Z. Year. Benefits and Pitfalls of Virtual R&D Teams: An Empirical Study. 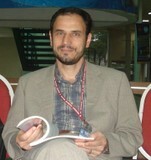 In: 6th International Communication & Information Technology Management Conference (ICTM 2010) February. 23-24 2010 Tehran, Iran. 1-5. ANDERSON, A. H., MCEWAN, R., BAL, J. & CARLETTA, J. 2007. Virtual team meetings: An analysis of communication and context. Computers in Human Behavior, 23, 2558-2580. CASCIO, W. F. & SHURYGAILO, S. 2003. E-Leadership and Virtual Teams. Organizational Dynamics, 31, 362-376. CHUDOBA, K. M., WYNN, E., LU, M., WATSON-MANHEIM & BETH, M. 2005. How virtual are we? Measuring virtuality and understanding its impact in a global organization. Information Systems Journal, 15, 279-306. EBRAHIM, N. A., AHMED, S. & TAHA, Z. 2010. Virtual R&D teams and SMEs growth: A comparative study between Iranian and Malaysian SMEs. African Journal of Business Management, 4, 2368-2379. GASSMANN, O. & VON ZEDTWITZ, M. 2003. Trends and determinants of managing virtual R&D teams. R&D Management, 33, 243-262. HERTEL, G. T., GEISTER, S. & KONRADT, U. 2005. Managing virtual teams: A review of current empirical research. Human Resource Management Review, 15, 69-95. LEENDERS, R. T. A. J., ENGELEN, J. M. L. V. & KRATZER, J. 2003. Virtuality, communication, and new product team creativity: a social network perspective. Journal of Engineering and Technology Management, 20, 69-92. POWELL, A., PICCOLI, G. & IVES, B. 2004. Virtual teams: a review of current literature and directions for future research. The Data base for Advances in Information Systems, 35, 6-36. WIKIPEDIA. 2011. Virtual team. Available: http://en.wikipedia.org/wiki/Virtual_team [Accessed 10 August].